I like simple things! Fresh wholesome ingredients, crisp flavors, and minimal ingredients. So when I find something I love, I make it often. 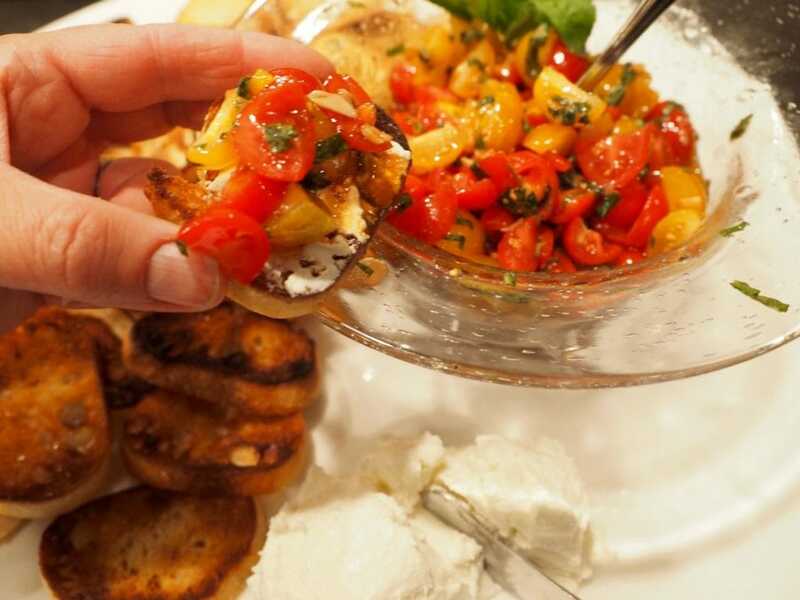 This recipe for easy tomato bruschetta with fresh basil, toasted garlic, olive oil and balsamic vinegar on top of a crispy crostini schmeared with creamy goat cheese — I make it often, especially during the summer, but equally as delicious during the winter! Kapow! Wow! Amazing! That’s what your mouth will say when you bite into this scrumptious appetizer. It’s fresh and bright, and you will be asked for the recipe every time. Inspired by The Pioneer Woman’s Bruschetta. 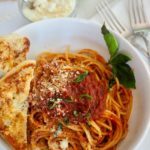 As is typical of my style, I modify, add and tweak based on what I have in my pantry, so here is my take on her recipe. Check hers out too! 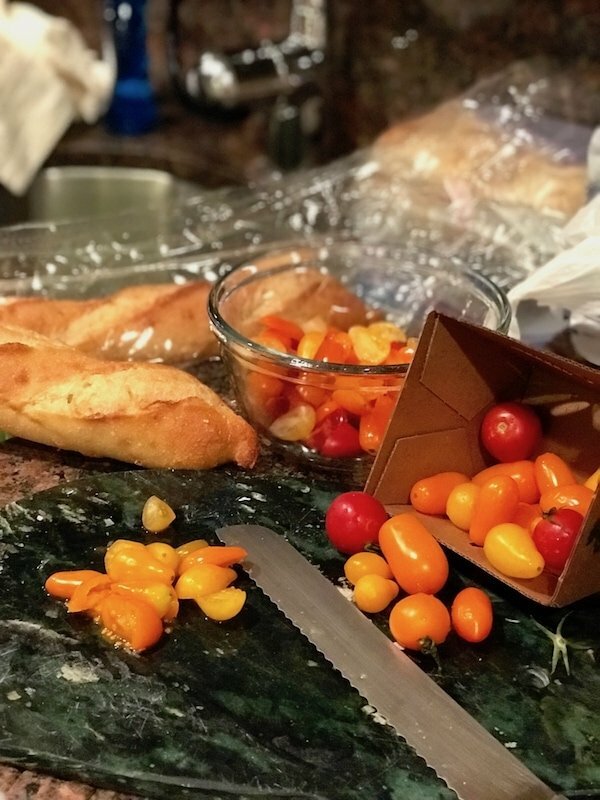 Buy a couple of fresh baguettes and slice them about ¼ inch thick, 1 – 1½ baguettes is usually the right amount, it never seems like there is enough bread. Or you can cheat and use the slicer in the bakery section of your grocery store; it slices the baguette super neat, nice and even. Lay out your sliced bread on a 1/2 sheet baking pan, and using a basting brush, “paint” the olive oil over the top of the bread slices then sprinkle with a little sea salt. Place in oven on broil on the middle rack, watch closely so you don’t burn them, set the timer initially for 2 minutes, then every one minute until they are done to your liking. Good thing my hubby likes them a little crisper. 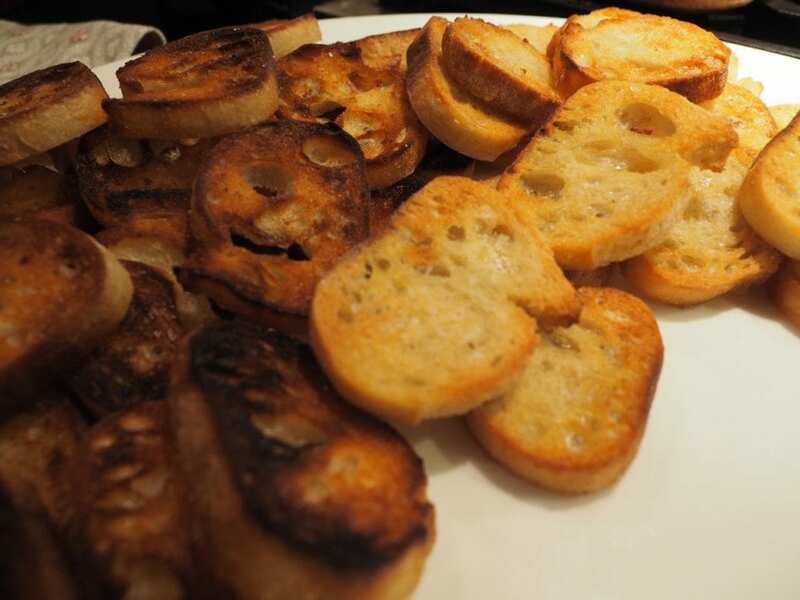 Toast until lightly brown crispy, not like the first dark batch on the left, but more like the lighter on the right. 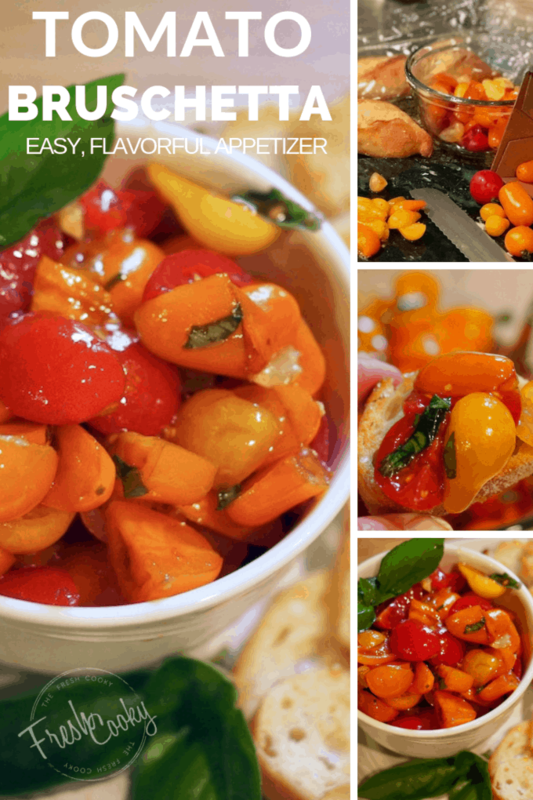 Now for the bruschetta, these ingredients scream fresh and flavorful! Cut tomatoes into quarters and place into bowl. Aren’t they beautiful, so full of color, even in the middle of winter. 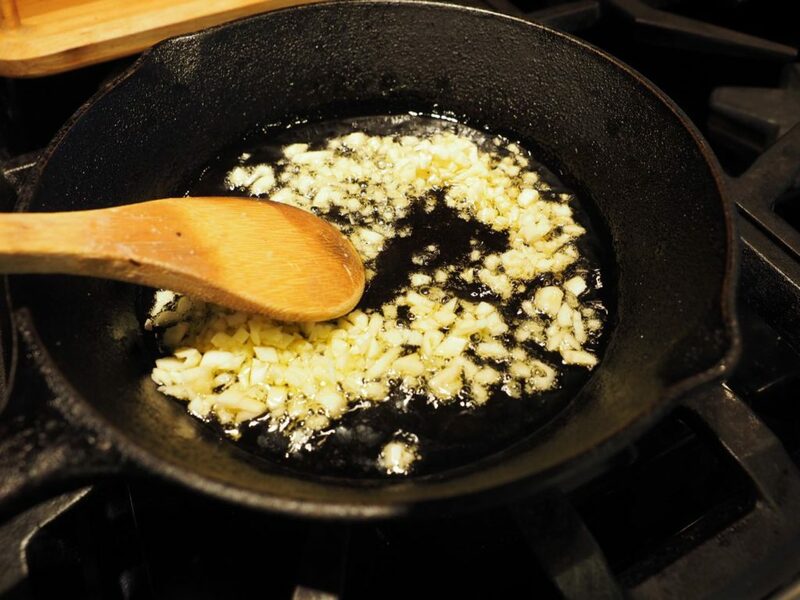 In a small pan, heat olive oil on medium, then carefully place minced garlic into the hot oil. Stirring or swirling constantly, it will burn quickly, so watch closely. How I love my cast iron pans! Just as a few pieces start turning brown, just a minute or so, remove from heat. 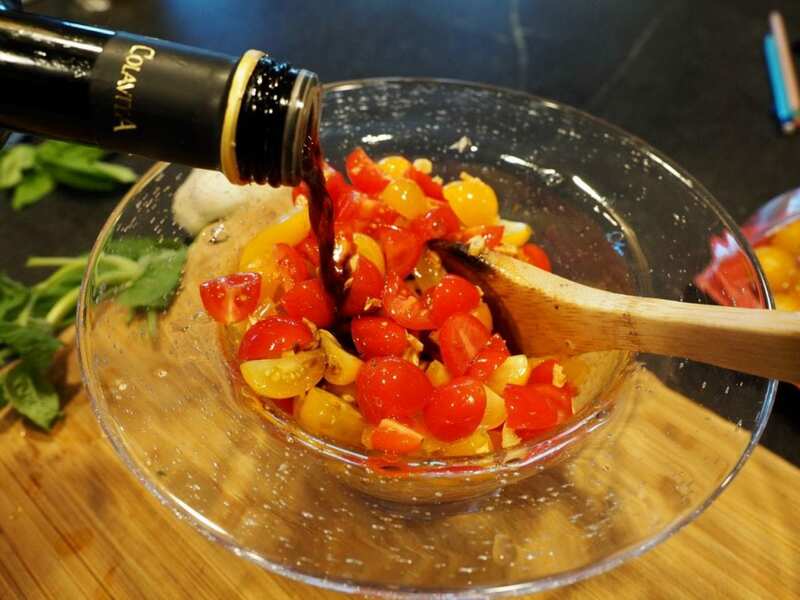 Pour in a couple glugs of balsamic vinegar. 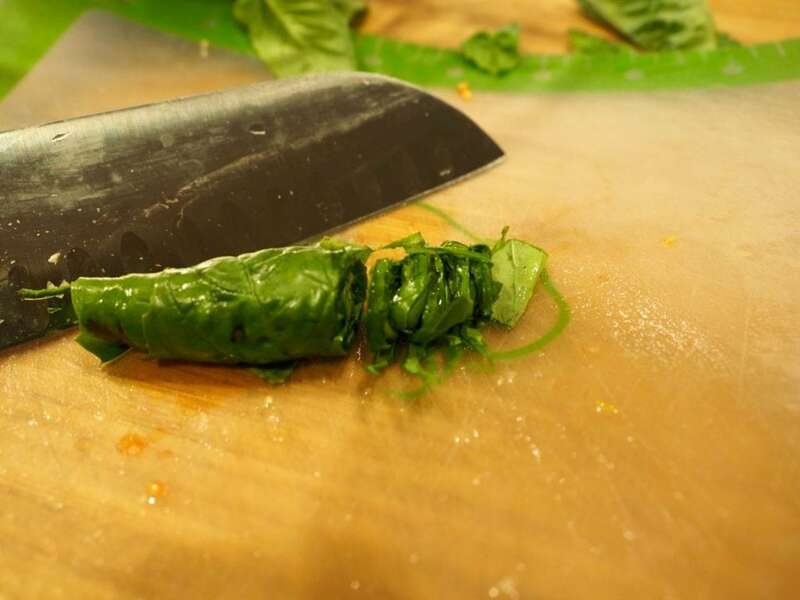 …then you roll them into a little cocoon and slice little “shreds”. 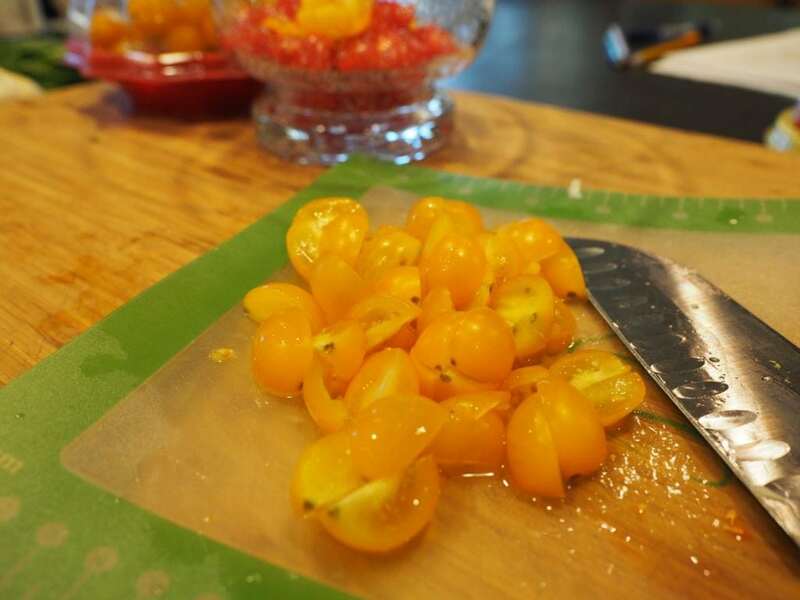 Mix into the tomato mixture gently and viola, you have an amazing appetizer. If needed, add a little more sea salt, but taste it before adding too much. Mix together and allow to sit on the counter (or fridge if not serving for awhile) allowing the flavors to marry. 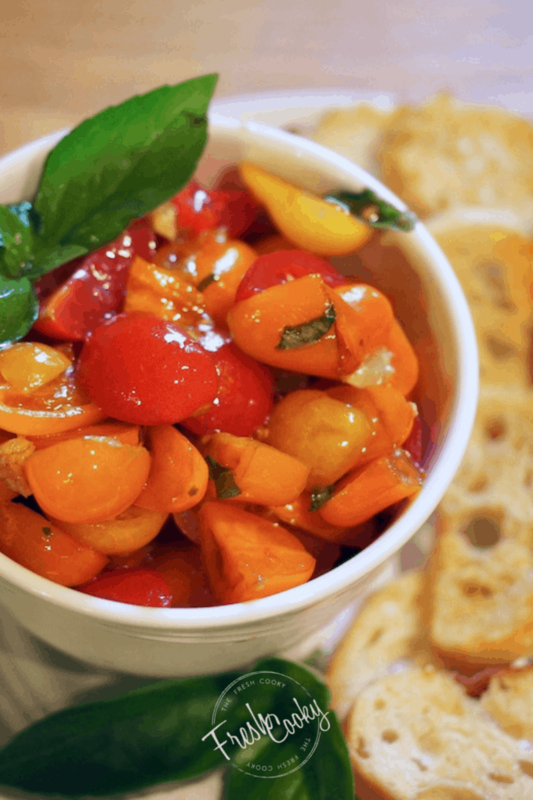 Serve with crispy crostini slices and a small log of goat cheese (let sit at room temp while you make your bruschetta). Now, for my favorite part, schmear some of that creamy goat cheese onto the crostini. Then spoon some of the bruschetta mixture on top of the cheese schmeared crostini, allowing the juices to seep in. You can also purchase the slightly firmer goat cheese crumbles and put them directly into the bruschetta mixture. Excuse me while I go eat some! Manga! TIP | Not just for an appetizer, try spooning this mixture on top of grilled chicken, or over a hot bowl of pasta. YUM! 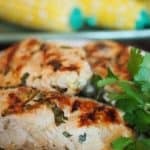 Other amazing, packed with flavor recipes! 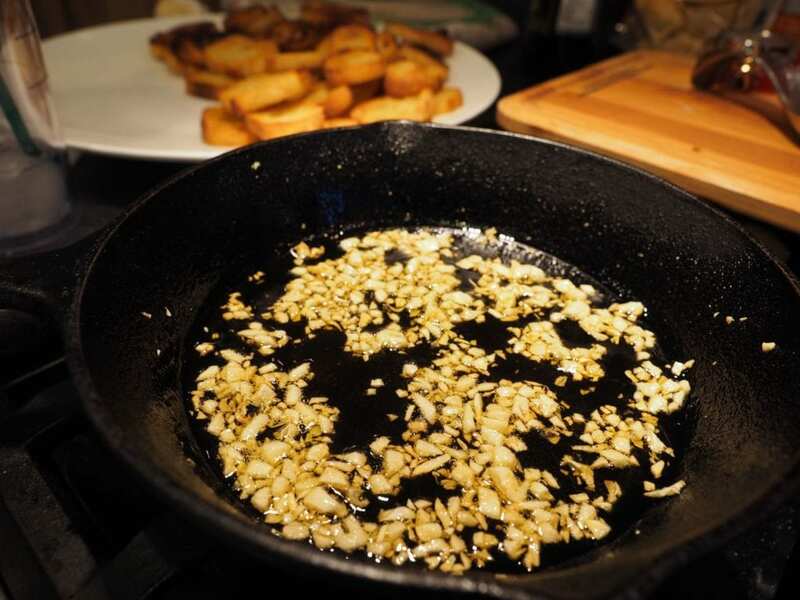 In a small skillet, heat oil over medium heat, stir, watching closely for about a minute, remove from heat just as first few pieces start turning golden brown. Cool slightly in pan. 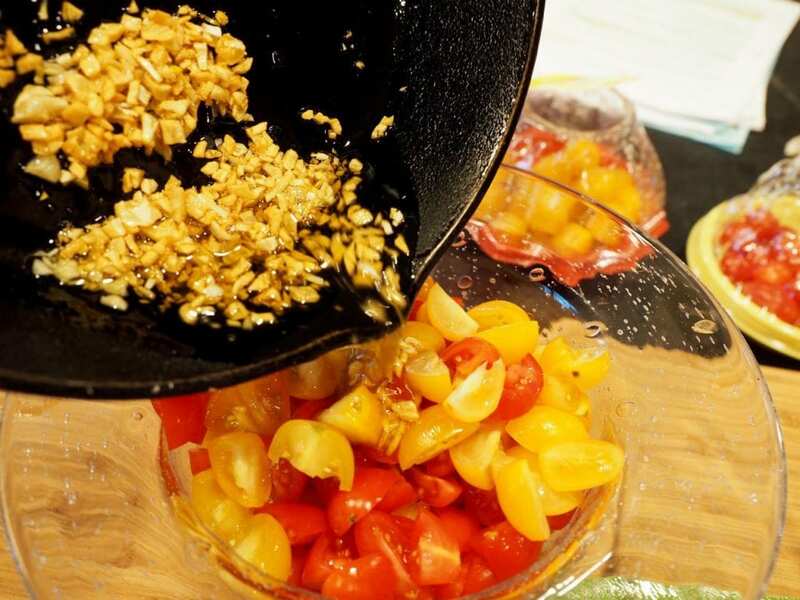 Add tomatoes to serving bowl, pour warm oil and garlic mixture over the top. 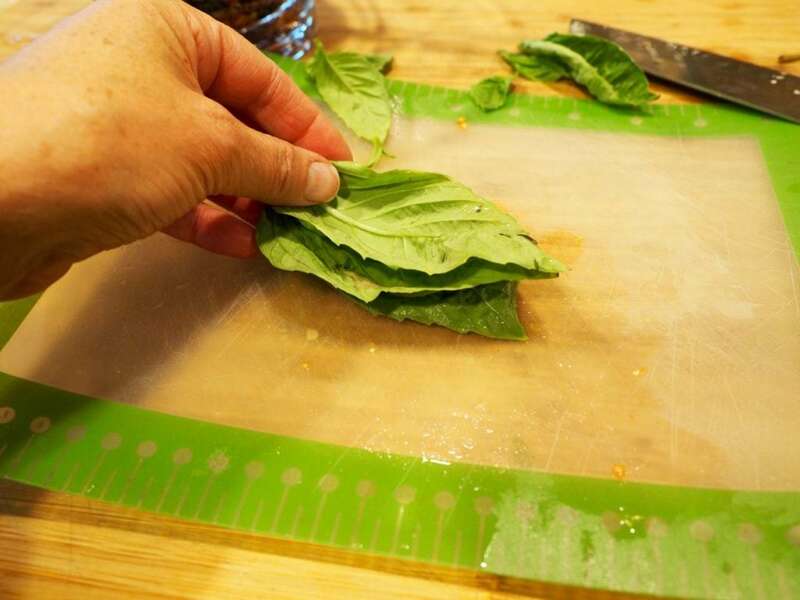 Chiffonade your basil, stacking a few leaves at a time, rolling and slicing gently to form crisp ribbons of basil. Stir gently into tomato mixture. Add balsamic vinegar, salt and pepper. Gently toss to mix flavors. Taste add more salt if needed. Cover and refrigerate for an hour or so if you have time. Slice the baguette (or use slicer in your bakery section at the grocery store) into even slices. Brush olive oil onto top slice of bread. Sprinkle with a few grains of course sea salt. Toast under broiler using the middle rack for a couple of minutes, watching closely, just takes a couple minutes Remove when golden brown. To serve, stir the mixture one last time. If desired, spread a little goat cheese onto a toasted crostini, then spoon some of the bruschetta on top, allowing the juices to seep in. Or you may also stir in firmer goat cheese crumbles into the tomato mixture just prior to serving. 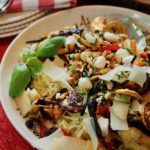 TIP | Not just an appetizer, try this over fresh hot pasta or on top of grilled chicken! © 2017 | This recipe for Easy Tomato Bruschetta was featured first on The Fresh Cooky. Thanks Peti! Wonderful, so glad you are going to try it, let me know how you like it! Hopefully it will be filling enough for him!